At the Uitenhage SPCA, willing hands are always needed. In fact, so many of our animals need the warmth and touch of a caring person as much as they need food, shelter and medical care. By volunteering only a few hours of your time each month, you could assist animals in a practical way and help fight the battle for those who have no voice. 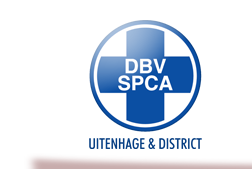 The Uitenhage SPCA has a variety of volunteer activities, so you can choose something you enjoy. Helping out at our many fundraising events. Joining in with community and school outreach programmes. Make a cash donation - regardless of the amount you can afford to give, your SPCA needs ongoing funding to continue operating, and every single donation (whether large or small) counts! Collection Tins - Keep one of our collection tins on your counter, if you own or manage a retail outlet or are a member of a club. Your small change makes a BIG difference to our Society! Sponsor one of our kennels, it's a meaningful and personal way to get involved in the care of a specific animal. Donate unwanted, clean, good quality clothing, books, and household items for our jumble – this not only helps raise money to care for animals, it also helps those less fortunate to buy badly needed items at affordable prices. Leave a legacy to the Uitenhage SPCA in your Will. 1. Only selected Saturdays from 9:00 to 11:00. 2. Interested people need to phone the office and book an appointment for a specific date. 3. Only 10 volunteers per Saturday. 4. All Children under 16 need to be accompanied by an Adult. 1 September, 15 September, 29 September, 27 October, 20 November 2018. The Uitenhage SPCA cannot accommodate all requests for community service projects by school children. However, pupils are urged to set up their own project whereby they have a collection of food for the SPCA, promote any upcoming events, get people to sign up for monthly debit orders. For more information on volunteering and community projects, please contact us. Please email the completed form to info@uitenhagespca.co.za. Thank you for your support.